A Card, A Canvas and A Celebrity. I had several things weighing heavy on my mind and I just said out loud to God, “please show me something that will take this burden off of me. Please.” I walked into my office and honestly, had very little hope that the Lord was going to be so bold. But then the picture on my desk of Jennifer Hudson’s Weight Watcher ad (which I keep on my desk for motivation) caught my eye. “BELIEVE. Because it works.” Of course it was referring to the tagline for Weight Watchers but God whispered to me, “I mean it. Believe. Because it works.” And He wasn’t referring to Weight Watchers! Share with me when the Lord showed up in a bold way in your life. 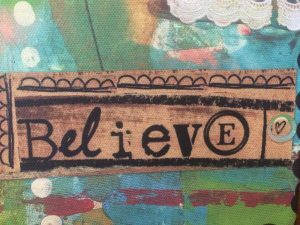 This entry was posted on August 18, 2017 with tags: #makeadifferenceeveryday, believe, kindness by Deanna Young.